Product Description: less text Spoil a loved one with the royal treat of an Iris Beauty in A Vase. 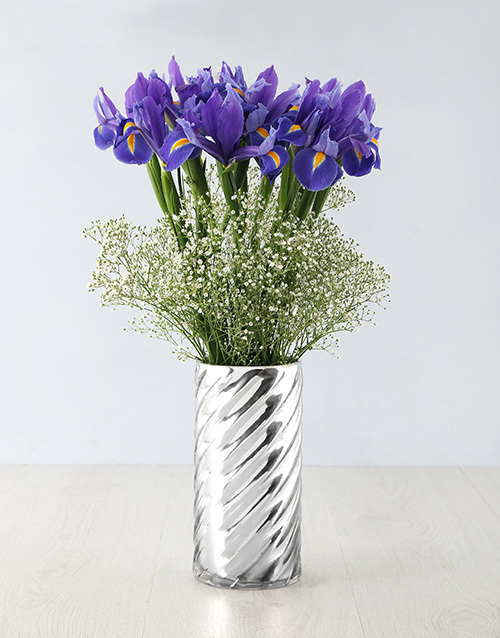 This stunning arrangement of Irises are complemented with million star and arranged in a silver, twirl, cylinder vase. Brighten someone's special day, for any occasion, with this amazing arrangement! Flower Arrives in bud Get this Iris Beauty In A Vase delivered with NetFlorist.